The comforts of home away from home, the charm of a traditional Santorinian house and the endless beauty of the volcanic landscape create the perfect setting for relaxation and tranquility. From each private balcony, the magnificent volcano views and awe-inspiring sunsets feel as if they exist only for you. The studios and apartments can be reserved individually for couples or small groups, or they can be combined to accommodate larger groups in a private two storey house arrangement. The complete villa complex can be reserved to accommodate up to 13 guests in comfort with a minimum stay of six nights. Villa Fegari is not the typical hotel or apartment experience. Each accommodation is unique in layout and decor. The interiors and terraces are stylish and warm, with an eclectic mix of vintage furniture, artwork and objects from around the world. The setting offers ultimate privacy and relaxation. Full service hospitality and personalized concierge serviceprovide every detail to craft your own unique holiday experience. 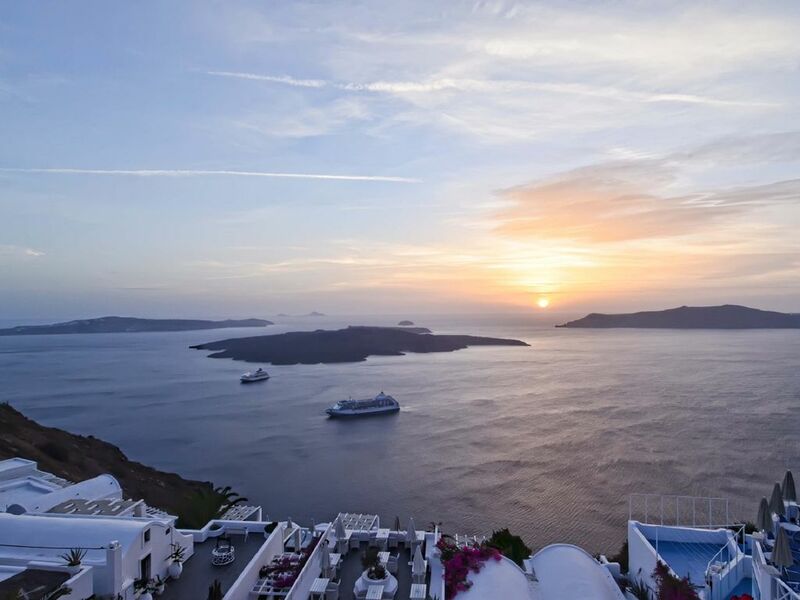 From car rentals, luxury caldera cruises and excursions, insider’s local dining treasures, sea and land sports, spas, wineries or any other desire, let us create your perfect holiday to enjoy all that Santorini has to offer. Cave, at the ground level, is the original house, named for its traditional “cave-house” style construction in 1912, carved into the rock of the caldera. Renovated in 2012, the apartment offers all of the modern amenities of home with the charms of a traditional Santorinian caldera house. Cave is a fully self-sufficient apartment, offering one bedroom with double bed, another open bedroom with a double bed, a large living room and dining area, a spacious bathroom and fully equipped kitchen. The gracious outdoor terrace is a room of its own, with spectacular views of the volcano, framed with vibrant flowers and grape vines: the perfect setting for morning breakfast or dining al fresco. A separate, private balcony provides an intimate setting for admiring the famous sunsets and caldera views. Cave is perfect for a family of up to 3 kids, a couple, a small group of friends. The apartment can also be rented together with Romance, on the first level, to create a private, two storey house with three outdoor balconies to accommodate 4-6 guests. Cave is a self-catering apartment with a fully equipped kitchen for preparation of meals. Daily maid service and linens are provided. Laundry service is available upon request. 24 hour on call “front desk service”.Concierge services are available for reservations of car rentals, dining recommendations and reservations, private cruises, wine tours and excursions, and any other island activities. We felt like we found a solid balance between price and location/view. It's an authentic cave experience and so it's not the nicest apartment you'll ever be in for that much money. But it's got an A+ location, amazing views from right outside your door, private patio with table, and a non-advertised benefit of being next door to a boutique hotel with pool that you can use for 10 euro per day. Overall, if you can live in a modest apartment with no TV and a basic kitchen, this place will give you a Santorini experience like the postcards for around $400. The Villa Fegari Cave Apt was incredible. I would give it 6 stars if I could! Our family of 5 had plenty of room. The views were breath-taking. The location was perfect. Easy walk to the main town of Fira. John was the best. He helped us with all of our needs. Could not have asked for a better family vacation. The wifi was not great- but that was actually a good thing! Loved our stay in Villa Fegari: the traditionnal villa is very well located. It has so much charm from being authentic cave house and had one of the best views from Santorini. Welcome staff makes your life easy with everything you might need. What do you not have...a poo? Just go to the hitel nextdoor. 1 improvement is maybe the basic ingredients in the kitxhen fot cooking & breakfast. Overall it was a great stay. Enjoyed our stay at the cave apartment. Lots of room for our family of 4 with two grown children. Check in and correspondence with owner/manager was excellent. John's service was like having our own concierge! Luggage was carried down and up the many stairs, he gave us a full run down on the island of Santorini, made dinner reservations for us and and had our rental car delivered and picked up right from the apartment! Couldn't ask for more from a property manager. Views from the outdoor decks are amazing. Close to everything, easy walk to Fira. Would highly recommend this location and apartment! The Cave apartment in Santorini is amazing! The view from the apartment balcony is one of the best views around Santorini. When we arrived at the airport we had a transfer organised for us ready to pick us up, we were greeted by Yiannis who brought us to the apartment and helped us plan out every step of our trip, he had a map ready for us and talked us through the best places to eat and the best things to do with the amount of time we had in Santorini. I can’t speak highly enough of the service we received here. Would definitely recommend staying here and when I do return I’ll be staying here again!